In today’s financial climate, many people struggle to go for night out as this can prove to be very costly. When you consider the cost of not only food and drinks but also entertainment and even transportation to your venue, the final cost of a night out can be worryingly high. This is why more people these days plan relaxing nights in at home where they can chill out, enjoy a little downtime, and minimise on cost without having to compromise when it comes to having a good night. Many say that ‘staying in is the new going out’ and this because there are plenty of options available for those who want to plan a chilled night in to unwind from the stresses of the week. There are all sorts of things that you can consider to make your night in all the more fun, relaxing, exciting and enjoyable. Pampering: If you are planning a girlie night in, you could enjoy a night of pampering with your friends. You can all kick back in your dressing gowns and pyjamas and enjoy facial treatments such as face masks and essential oil massages. You could even club together and call in a professional to administer the treatments – a great choice if you are having a night in ahead of a special event such as a wedding. Relaxing bubble bath: If you are having a night of peace and quiet on your own, you will really benefit from a wonderful, aromatherapy bubble bath. These are ideal for helping you to relax and de-stress and will leave you feeling warm, cosy and ready for some serious R&R. After a long soak you can slip into your favourite pyjamas and a comfortable dressing gown and then prepare to enjoy a wonderful, relaxing evening in your own company. Get some movies together: When it comes to entertainment for a night in, having a list of movies is essential. This is a great idea whether you are having a night in alone or you are inviting friends over. Make a list of all the movies you thought of watching – mix things up a bit when it comes to genre so that you have a wide range of different movies to watch over the course of the night. You can then get them together on DVD or stream them online. Order a takeaway: Good food is another essential part of a great night in but the last thing you want to do is be stuck in the kitchen cooking. So, instead of slaving over a hot stove treat yourself to a takeaway to enjoy while you watch those movies. 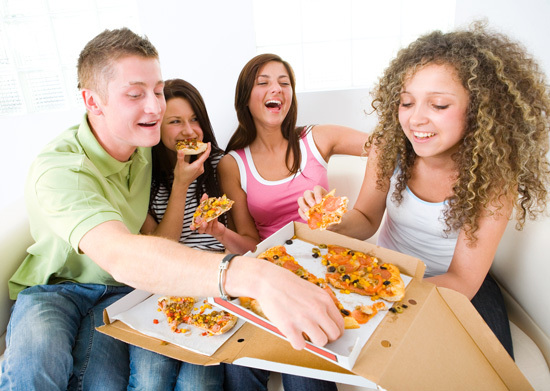 Pizza is a very good choice and you can get some fantastic deals at the ever-popular papajohns.co.uk with pizza options available to suit all tastes along with a huge choice of sides. Make sure you take advantage of the discount vouchers from VoucherBin when you order, as these will help to cut costs even further. Club together for drinks: A lot of people tend to enjoy a few drinks such as beers, wine and cocktails when they go out. However, the cost of drinks at a bar can quickly mount up. When you have a night in you and your friends can club together and buy a selection of drinks catering for different tastes – you can even look up some cocktail recipes online and take it in turns to create delicious cocktails for one another to make the night even more fun. Take some time out to read: You may be hoping for some proper ‘me’ time where you get to spend time alone and enjoy peace and quiet for the evening at home. If this is the case, you will find that reading is a wonderful way to relax. Get some of your favourite books – or even new books that you are keen to try – and keep them ready for your solo evening of relaxation. You can then snuggle up on the sofa or even in bed and lose yourself in a captivating story. As you can see, there are many great possibilities for those who want to enjoy a cheap, relaxing and enjoyable night at home rather than having to go to the expense and hassle of going out. Whether you are alone or with friends, you will find plenty to keep you occupied and you will save yourself a small fortune in the process.